02.03.2004 - This was a very challenging job. The homeowner knew she had a raccoon in her attic. She'd called another company to take care of the problem, but they told her that it'd be a minimum of $2000 to solve the problem, and that they'd set traps on the ground outside the house. I know that if a raccoon is in the attic, it's going to be a female raccoon with babies, and that traps on the ground will not solve the whole problem. There's 3-4 baby raccoons somewhere in the attic, and they must be removed, or they will starve and die without their mom. I was hired because I knew a lot more about the situation than the $2000 company. I arrived at the house and did a full inspection and found some open areas on the roof that the raccoon had torn into. I got in the attic and started my inspection. I could not find any raccoons. It's possible that the female was out foraging for food when I arrived in the late evening. This was the most convenient time for the customer. The $2000 company would only meet during 9-5. I searched in the attic for over an hour, looking for the young. I knew that they had to be up there somewhere. Most wildlife trappers don't even search, and then they give up if it's not an easy 5-minute job. I never give up. I looked in every last nook and cranny in this huge house, and I finally sat very still in the perfect dark of the attic and listened for 5, 10, 15 minutes.... finally I heard some faint chattering, and I knew it was the baby raccoons. I headed to the spot, crawled into a tight crevice, and looked down a tight and obscure wall, and I could just make out the edges of some baby raccoon fur. I finally found them. But they were impossible to get. There was no way to reach or use a snare pole in that area. I went outside, and I told the customer the situation. I got out my 24' ladder and climbed up to the second story area near the attic and the wall I'd climbed to inside. I felt the wall for warmth, and sure enough, there was a warm spot. I cut a hole a foot above it, and removed four young raccoons, as seen above. I fixed the hole and painted it, and it was good as new. I used the baby raccoons for bait and I trapped the mother raccoon. 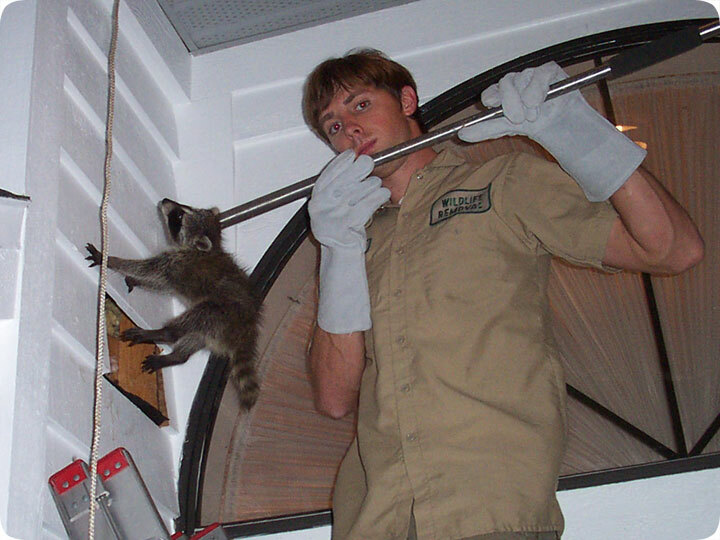 I then fixed all the holes on the roof leading into the attic, and I cleaned up the raccoon poop in the attic. The job was complete in two days, and I did a better job than anyone else ever would have. No one else would have found those baby raccoons. Heck, few people would have even been able to crawl where I went. The other companies just send out a lazy employee who just wants to set some traps on the ground and get to the next house. They don't care about animals. I did it right, and my total bill, including all repairs and cleanup, was $229.